William spent Tuesday afternoon filming part of a new documentary on Entartete Musik for Franco-German Arts TV channel Arte with baritone Simon Wallfisch. A fascinating session – watch this space for more information on its release. Cue newspaper has published a very nice review of Njabulo Madlala and William’s recital on Friday night, part of the South Africa National Arts Festival. The programme will be repeated tonight at 8.30pm. William was awarded the Accompanist’s Prize at the 2014 Association of English Singers and Speakers competition (www.aofess.org.uk) last night at the Royal College of Music. 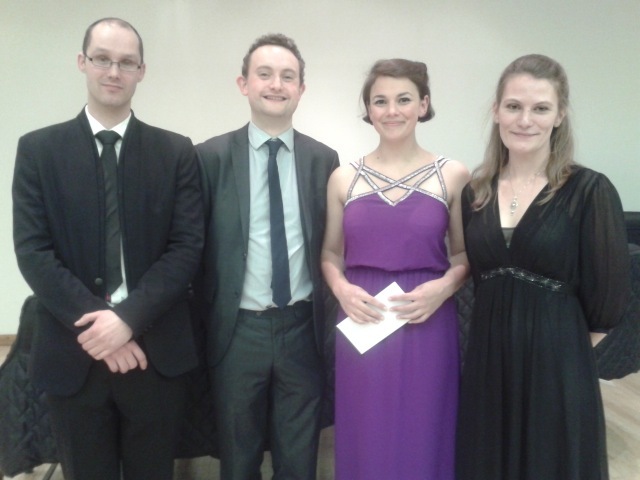 The three singers prizes (from left to right) went to Alexei Winter, Raphaela Papadakis and Heather Caddick. Booking for the London English Song Festival 2014 (of which William is the founder and Artistic Director) opens later today (on Thursday 13 March) from this website and from the Cadogan Hall box office: four recitals run from 5 to 11 June in the central London churches of St James’s, Piccadilly and St George’s Hanover Square plus a bring-a-song workshop at the Forge on Sunday 8 June. Artists this year include world-renowned mezzo-soprano Ann Murray DBE, Allan Clayton and the Navarra Quartet, Katie Bray, Johnny Herford, Gareth John and Alexander Sprague. There are concerts to celebrate the 60th birthday of composer Judith Weir and to commemorate the outbreak of WW1. Don’t miss a note! In Tune with Njabulo Madlala – today! 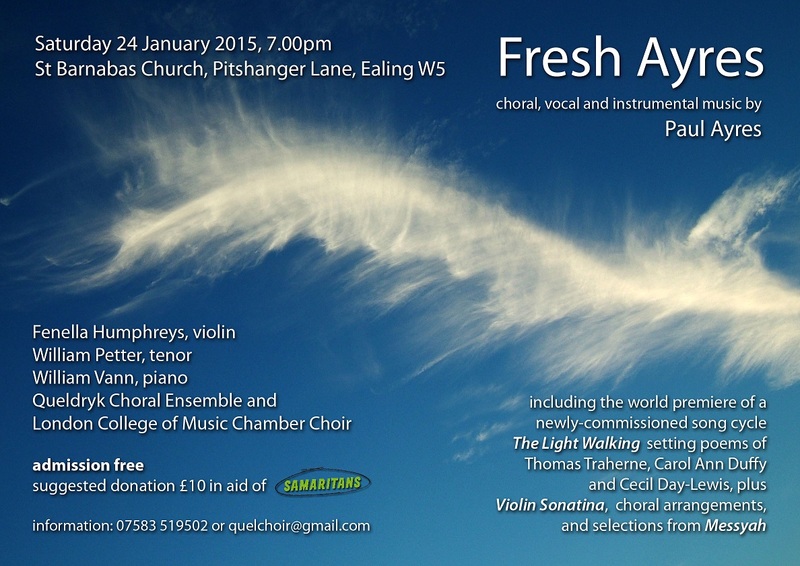 Tune in to Radio 3 shortly (after 6pm) to hear us perform extracts from our new CD. Will’s first CD on the Champs Hill label – “Songs of Home” with baritone Njabulo Madlala is released tomorrow – you can buy it now from the shop section of this website. Johnny Herford (baritone) and Will were awarded the Jean Meikle Prize for a Duo in the 2013 Wigmore Hall International Song Competition on Tuesday night. We’re both hugely grateful to the Jean Meikle Trust, Wigmore Hall and the panel for the award and looking forward to many more performances together – starting on 26th September with Die schöne Müllerin! William will accompany baritone Johnny Herford and soprano Elinor Rolfe Johnson at Wigmore Hall for the beginning of the final stages of the 2013 Wigmore Song Competition – Johnny is on 31st August at 11.45 and Eli at 11.30 on 1st September. William accompanied baritone Johnny Herford in the final of the Kathleen Ferrier competition last Friday and Johnny picked up the song prize – a deserved accolade for a brilliant song singer. Congrats to Johnny!